High Leigh, on the outskirts of Hoddesdon, Hertfordshire, is only just over a mile from the Pulham Manufactory in Broxbourne. The owner was Robert Barclay, a member of the famous banking dynasty. Over the generations, his ancestors had married into a number of other banking families, and Robert was responsible for merging twenty banks into Barclay and Company Ltd. [i] He would almost certainly have known James 2 personally, because his family had been leading members of the Quaker fraternity for many years – as, I am sure, were the Pulhams – and they probably attended the same Friends Meeting House in Hoddesdon. 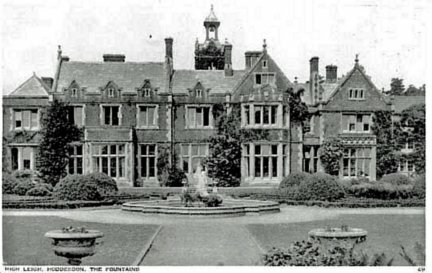 His wife, Elizabeth Ellen Buxton, was also likely to have met the Pulhams through a number of family connections. Her father was a member of the Board of Truman, Hanbury and Buxton, so one link would have been via Robert Hanbury 1 and Robert Hanbury 2, owners of Poles Park, Ware, and Bedwell Park – see Site of the Month No 4, September 2011 – respectively. 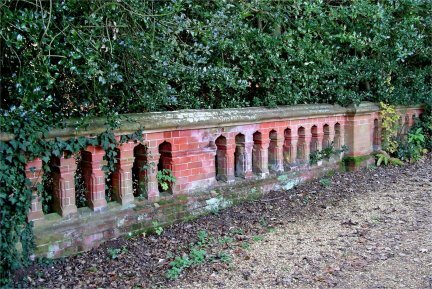 This is by no means one of his largest creations, but it is nevertheless interesting, because it presents several typical Pulham features within a comparatively small area. In view of its close proximity to the Pulham headquarters at Broxbourne, one could almost imagine it being used in its early days as a sort of local showplace, where James 2 could arrange to present a range of his work to potential clients. 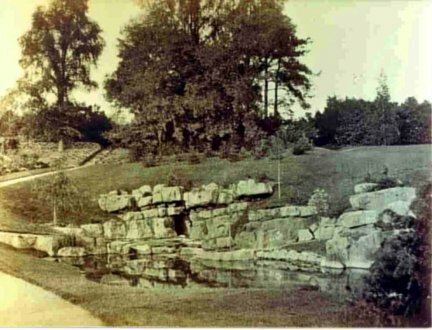 Fig 2 shows the cave and grotto – really a sort of mini boathouse – and cascade, as they were in 1900, while Fig 3 shows them in 2000. This is the centrepiece of the installation, and the water used to be circulated by a pump situated just above the top level of the cascade, drawing water up from the lake. 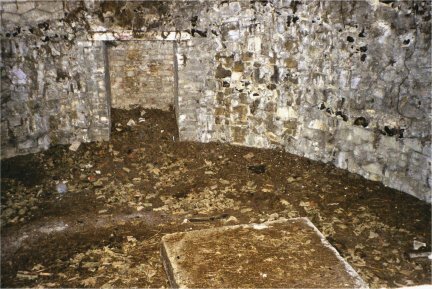 The pump was powered by a donkey walking round and round inside a sunken chamber near the top of the cascade, (Fig 4), and, although the interior of the pump house is nothing more than a circular underground room, James 2 even went to the trouble of rusticating the outside of the entrance (not shown here) in his own inimitable style. 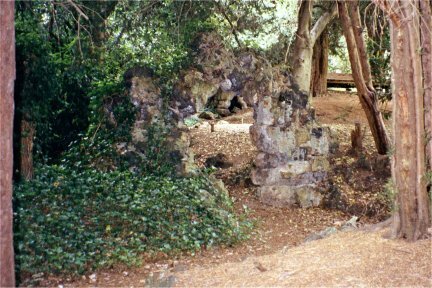 The stream flows from the cascade, under a small bridge, and into a lake, and, returning to the house from here, one encounters another of Pulham’s hallmarks – a ‘rock archway’, pictured in Fig 5. The only part of this structure that still remains is the core of bricks, so any Pulhamite coating must have disintegrated since. I have to admit that, on my first visit in 2000, my initial reaction to this site was one of slight disappointment, because the special Pulham features were considerably overgrown. There is, however, a good reason for this. High Leigh is now a Conference Centre run by the Christian Conference Trust, so the accent is far more on economically priced conference facilities than it is on garden maintenance. As a registered charity, all operating profits – such as they are – have to be channelled primarily into the provision and extension of accommodation, which consequently makes it extremely difficult to find money for the provision of the labour that would be required to bring this rock feature back to life. Considerable progress had been made by the time of my second visit in 2003, – a new ‘strimmer-type’ machine had been acquired, and put to very effective use – but, when I returned again in 2009, the site had drifted back into a state of sad neglect. 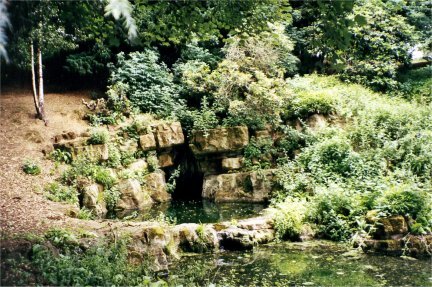 Posted on January 1, 2012 June 4, 2016 by Claude HitchingPosted in Sites Month 2Tagged . . James Pulham and Son, artificial lake, Barclay's Park, cascade, cave, High Leigh, Pulham bridge, pump house, Robert Barclay, rock archway, rockery.